II. 6 credit hours of INTD or IDS-approved courses at the 2000-level or above. III. 3 credit hours of an INTD course at the 3000-level or above. In total, a minimum of 18 IDS credit hourse is required. 3 credit hours INTD with theory at the 3000 or 4000-level; that is, any INTD course at the 3000 or 4000-level excluding INTD 3002, INTD 3003, INTD 3107, INTD 3109, and INTD 4012. IV. 12 credit hours of INTD or IDS-approved courses at the 2000-level or above. V. 6 credit ours of INTD or IDS-approved courses at the 3000-level or above. In total, students must take a minimum of 30 IDS credit hours and a maximum of 36 IDS credit hours. IV. 12 credit hours of INTD or IDS-approved courses at the 2000-level or above. A maximum of 6 credit hours can come from INTD. V. 6 credit hours INTD or IDS-approved courses at the 3000-level or above. In total, students completing the 90 credit BA concentraion may take a minimum of 30 IDS credit hours and a maximum of 42 IDS credit hours. V. 6 credit hours of INTD or IDS-approved courses at the 3000-level or above. In total, students completing the 120 credit BA double major may take a minimum of 30 IDS credit hours to a maximum of 54 full credits. IV. 12 credit hours INTD or IDS-approved courses at the 2000-level or above. A maximum of 6 credit hours can come from INTD. V. 12 credit hours of INTD and/or IDS-approved courses at the 3000-level or above. In total, students completing the 120 credit BA major may take a minimum of 36 IDS credit hours to a maximum of 54 credit hours. V. 18 credit hours of INTD and/or IDS-approved courses at the 2000-level or above. A maximum of 6 credit hours can come from INTD. VI. 6 credit hours of INTD or IDS-approved courses at the 3000-level or above. In total, students completing the 120 credit BA Combined Honours (Thesis stream) may take a minimum of 42 IDS credit hours to a maximum of 54 IDS credit hours. V. 18 credit hours of INTD and/or IDS-approved courses at the 2000-level or above. A maximum of 6 credidt hours can come from INTD. In total, students completing the 120 credit BA Combined Honours (Coursework stream) may take a minimum of 42 credit hours to a maximum of 54 credit hours. VI. 18 credit hours of INTD and/or IDS-approved courses at the 3000-level or above. In total, students completing the 120 credit Concentrated Honours (Thesis stream) may take a minimum of 54 IDS credit hours to a maximum of 66 IDS credit hours. In total, students completing the 120 credit Concentrated Honours (Coursework stream) may take a minimum of 54 IDS credit hours to a maximum of 66 IDS credit hours. 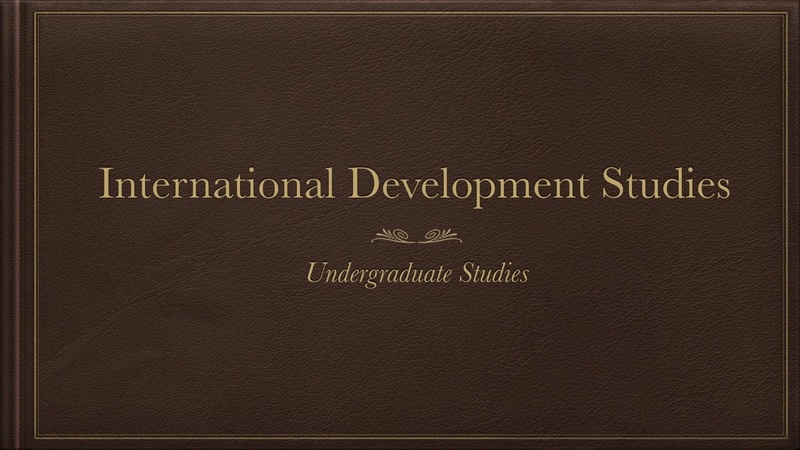 International Development Studies is an interdisciplinary program involving the study of poverty, inequality, social change and justice in a global context. The IDS program is structured around two broad axes: development theory/practice, and the global/local. Areas of teaching expertise among the core faculty in IDS include development theory, gender, culture, human security, rural development, migration, health, Indigenous peoples, participatory development and global citizenship; however, additional areas of expertise are drawn from over 50 cross-appointed and adjunct faculty members who teach IDS approved courses and/or supervise our honours thesis and graduate students. The department's areas of expertise include many of the key regions of the developing world, particularly Africa, Asia, Latin America and the Caribbean. We take a broad view of development - including development issues within Canada as well as the developing world. As an interdisciplinary program, IDS recommends students consider combined degree programs. Students are therefore encouraged to enter the combined honours or double major programs, which provide opportunities that further integrate their IDS studies with those of an approved arts or science field, e.g., IDS and History, IDS and Biology. Double majors and combined honours degrees provide additional opportunities for students to pursue graduate studies in more than one area.